Jordan is using Smore newsletters to spread the word online. A flood can be caused by heavy rainfalls, hurricanes, and tsunamis. Floods are mostly found around costal areas. We can predict when a flood is about to occur by monitoring the amount of rainfall in the area. The weather channel is a very useful way to alert people of whats to come. We can help one another by simply communicating the issue as well. For a flood, you must move what you need including yourself up stairs, or on the roof. Also turn off all gas and electricity lines immediately. This 1964 trauma happened in Mekong Delta, South Vietnam. This disaster occurred in December, Mekong's dry season. Riverside crops of tomatoes and cabbage were swept away, Fish farms were wrecked, and boats were sunk. 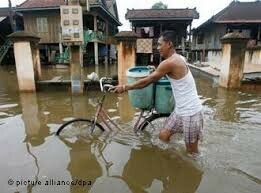 Overflows from the Mekong river caused floodwater and left many homes and districts submerged. The river was already known for uprising weeks before, it wouldn't come to a stop and it resulted to a flood. More than 90 people are to have died in this flood. The damage this flood created were difficult to repair, such as the markets where people sold food and much more. Now people take boats on the river, and lay their goods out for sale.